Top Psychic Source Advisors read for Lady Antebellum, T-Pain, Ian Ziering, G.R.L., Grace Potter and Redfoo, revealing details about their personalities, careers, and futures. A video with highlights from the psychic readings will release September 8, 2014 (with blooper reel to follow). It’s exciting and inspiring that public figures such as Grace Potter, T-Pain, Ian Ziering, and others have agreed to share their experience with psychic readings. It shows that celebs are people too—worried about their futures and their families. Musicians, actors, athletes, you name it; psychic readings, are becoming quite the hot commodity. 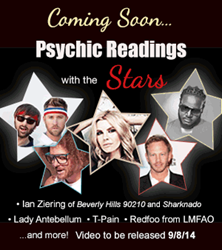 This summer, the gentlemen of Lady Antebellum, T-Pain, Ian Ziering, G.R.L., Grace Potter and Redfoo got readings from Psychic Source, the most trusted psychic service since 1989, revealing details about their personalities, careers and futures. From hysterical to emotional, the readings’ highlights were captured on video to be released September 8, 2014. The video divulges exciting predictions for the stars, including Grace Potter’s possible future affair, the amount of Sharknado movies to be produced (according to Ziering, they’ve already green lit a third), and the future of T-Pain’s career. Whether you’re an advocate of psychics or a complete skeptic, the video is nothing short of entertaining. There’s even a blooper reel to follow. Stay tuned for the official highlight video, Psychic Source Celebrity Readings: Episode 1, due out September 8, 2014 on PsychicSource.com.